Popular first as a medicinal herb used by pre-colonial Native Americans, and then finding its way into 19th century cultivated flowerbeds, the black-eyed Susan (Rudbeckia) has a rich history as a native wildflower. Many are drawn to the simple, daisy-like form of this member of the aster family, but breeders have added many colors and forms to the Rudbeckia menu in recent years. Asking for little beyond regular garden loam and a full day of sun, Rudbeckia plants will bloom during the dog days of summer and beyond, attracting bees and butterflies with plentiful pollen and nectar offerings. Include a few Rudbeckia plants in your cottage garden plan, let them grace your flowering containers, and install some of the rugged flowers beside your mailbox for a cheerful welcome home. Chances are, if you’ve seen Rudbeckia plants in commercial landscaping applications, they are the "Indian Summer" variety. Interest in this cultivar exploded after the All-America Selections named it a 1995 winner. You can grow this heat and drought tolerant plant as a short-lived perennial in zones 3 to 7, but it blooms from seed its first year and volunteers freely, making it suitable as an annual as well. Watch for the fuzzy green seedlings to emerge in early spring, and thin them out to give the plants adequate spacing, which helps to prevent mildew from poor air circulation. The green centers of this orange and yellow flower give it versatility in cut flower arrangements, popping nicely against blue flowers like delphiniums, bachelor’s buttons, and asters. In this photo, the flowers contrast with the draping form of annual amaranth flowers, an heirloom also known as "love-lies-bleeding." Buy small transplants sold in nursery cell packs in the spring for flowers that last from June until ​the first frost. Although your original plants may not return, self-seeding will refill the flowerbed for the following season. This dwarf gloriosa daisy, topping out at 12 inches tall, deserves a special place at the front of the sunny flower border. Burgundy and orange flower petals provide the rich jewel tones that accent classic fall flower arrangements. Remove all foliage below the water line, and the cut flowers should last 10 to 14 days. Butterflies, birds, and bees will not miss these glowing yellow beacons on 30-inch tall plants. Combine this bold wildflower with other natives like liatris, saliva, or butterfly milkweed for a low maintenance flower garden, even in areas with heavy clay soil. Highlight the attractive green centers of these blooms by pairing them with green flowers in your flowerbed, like zinnia "Envy" or rudbeckia "Green Wizard." Rudbeckia "Cherokee Sunset" looks more like your typical dahlia than a humble black-eyed Susan flower. The semi-double to fully double blooms are deer resistant, like all rudbeckia flowers. This variety is a 2002 AAS winner. The "Maya" gloriosa daisy is reminiscent of fall mums or the "Teddy Bear" sunflower with its layers of frilly petals. The 18-inch height is perfect for containers or flower borders, and the Fleuroselect Gold Medal award tells you that this plant won’t flop or succumb to disease when growing conditions are less than perfect. The tips of this dark orange flower look like they were dipped in bright yellow paint. The casual form of these 5-foot plants looks great swaying in the breeze alongside ornamental grasses or verbena bonariensis. Honor the low care preference of these flowers by withholding artificial fertilizer, which can cause tall varieties like this one to flop. "Cherry Brandy" has everything a gardener could want from a Rudbeckia: numerous flowers with a long bloom time, attractive to pollinators, deer resistant, and drought tolerant. The blooms of "Cherry Brandy" are a clear vibrant reddish-maroon, not the muddy off-red seen in some red gloriosa daisies. 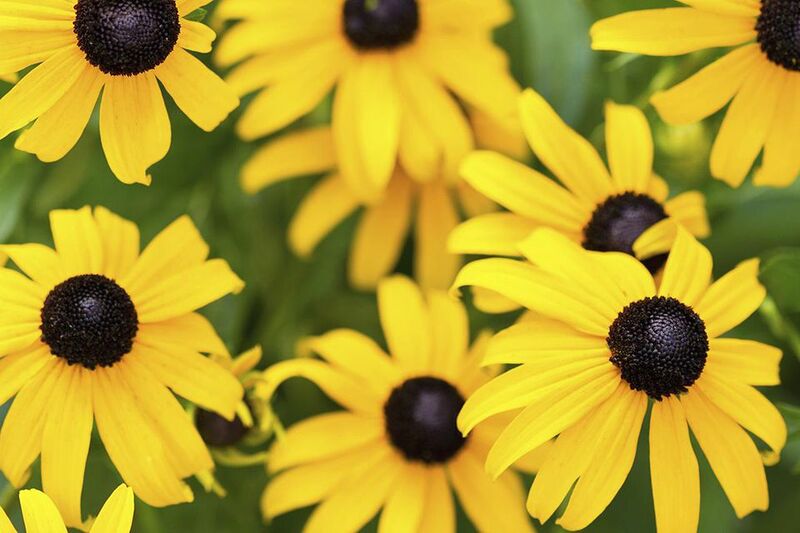 Take advantage of these attention-grabbers by pairing them with the contrasting colors of Rudbeckia "Irish Eyes." Rudbeckia maxima fills a niche where tall flowers are concerned: this native wildflower can attain heights of 7 feet in the garden. The foliage looks great too; prominent bluish-green leaves give this plant the alternate nickname of "cabbage flower." The drooping rays seem to be bowing down to the very prominent brown cones of this variety. A must in any cottage garden, giant coneflower tolerates a wide range of growing conditions in zones 4 to 9.